Pressure gauges are very common instruments in the process industry. As with any measurement device, pressure gauges need to be calibrated at regular intervals to assure they are accurate. There are many things to consider when calibrating pressure gauges. This article lists 20 things you should consider when calibrating pressure gauges. Gauge calibration helps ensure you have the accurate readings needed to meet quality, safety, and compliance standards and regulations — errors and inaccuracies may have costly consequences. While, modern pressure gauges are remarkably robust, even the sturdiest gauges experience wear and tear and accuracy degradation over time. Conditions such as vibration, spikes, and mechanical and electrical shock can impact the accuracy of the gauge. Other particularly harsh conditions imposed by the process such as aggressive and corrosive media and extreme temperatures may also affect gauge accuracy. Gauge calibration verifies and, if needed, restores the accuracy of a measuring instrument to proper working conditions. Periodic gauge calibration keeps the integrity of the readings and ensures proper, consistent measurements. Gauge Calibration – When is it needed? In some industries, best practices call for gauge calibration at least once a year. Instruments used in pharmaceutical, biotechnology, medical, and food processes may need to be calibrated more often to ensure proper quality control of the product. Many manufacturers determine a specific gauge calibration schedule at fixed intervals or after a certain number of operating hours for each particular type of instrument. Gauge calibration is also warranted after the instrument is subjected to a potentially damaging event, such as exposure to unusual shock or vibration, or to extreme changes in environment conditions. New, repaired, and modified instruments also must be calibrated before being connected to the process. 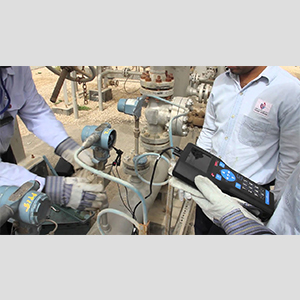 An additional best practice is to calibrate an instrument before a critical measurement. And, of course, any time that a measurement seems questionable, a proper gauge calibration will ensure that the instrument is working within acceptable limits. A measuring instrument that has lost its accuracy may lead to expensive errors. Entire batches may have to be thrown away due to inaccurate measurements of process and quality control parameters. Units may be shut down because they do not pass regulatory audits. Fines may be imposed for failing to comply with regulations. With so much on the line, it is imperative that gauge calibration is preformed regularly. However, gauge calibration is useful only if it’s done properly and accurately. It’s important to be sure instrument calibration is performed by a certified service provider who will follow recommended standards.